It is September 1777. The War for American Independence, in its second year, is in an uneasy stalemate. The Continental Army, led by General George Washington, scored two successes in late 1776 with victories at Trenton and Princeton. The British however, under General Sir William Howe, control New York City. Looking to put an end to the rebellion, Howe sets his eyes on Philadelphia, the American capital and seat of the Continental Congress. Washington and the Continental Army are encamped at Morristown, New Jersey to keep an eye on the British in New York. The British make their move as Howe sails his troops out of the New York City harbor. Washington doesn&apos;t know where they are headed yet. He receives a report that they are nearing the mouth of the Delaware River, but the British keep sailing south. Was Howe heading to South Carolina? The fleet lands in the Chesapeake Bay, putting Philadelphia in great danger. Washington rushes south to defend his nation&apos;s capital. Howe and his army, 15,000 strong, march up from Delaware into Pennsylvania. Washington sets up strong defense positions along fords at the Brandywine Creek, an advantageous position to repel the British theat. Howe knows the land better however, and sees two undefended fords that Washington has overlooked. He divides his forces and sends the majority of his soldiers north to flank the Continental Army. The remainder, 5,000 men, engage the American defense at Chadds Ford head on to distract them. The battle begins under heavy fog, which help screen the movements of the British army. 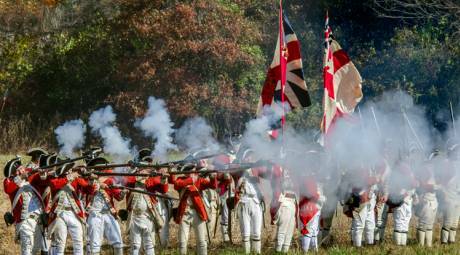 The 5,000 British soldiers eventually push Washington's army back three miles. At 2 p.m., 10,000 British troops appear on the American's undefended right flank, threatening the army's complete annihilation. American divisions under Generals Sullivan, Stirling, and Stephen, frantically reposition and desperately fight to buy time. Most of the Continental Army is able to escape. The British army was relentless. Having just routed Washington's army at Brandywine, the British plan a surprise assault on the Continental camp near the Paoli Tavern. They devastate the unprepared Americans on the evening of September 20 with bayonets and swords, killing 53 soldiers and wounding more than 100. Soldiers who surrender are stabbed or burned. It is has become known as the Paoli Massacre. On the night of the Paoli Massacre, the British held a secret meeting at the Historic General Warren to devise a plot to capture the elusive General "Mad Anthony" Wayne. 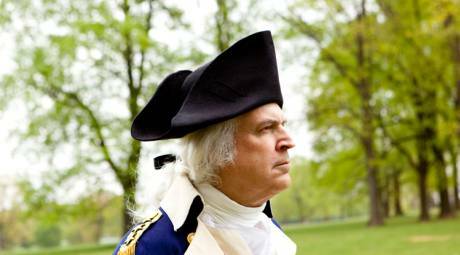 This daring commander of the Continental Army was also cunning. When the British arrive at his home, Historic Waynesborough, an empty house is all that greets them. 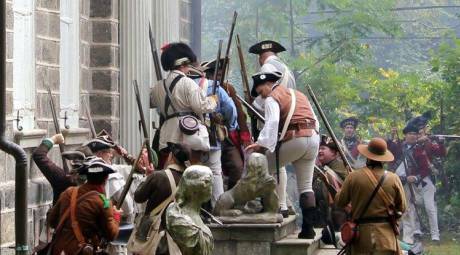 The Continental Congress flees Philadelphia on September 17 as the British move in. Washington knows that he has one last opportunity to drive the British out of Philadelphia before the arrival of winter. Headquartered at Peter Wentz Farmstead, the general plans his next move. General Washington mounts a daring offensive to chase the British from Philadelphia. Hoping to surprise them at Germantown, he silently moves his army through the dark early morning of October 4. The complex maneuvering proves too difficult for the undisciplined army, however, and they are fired upon by British pickets. At Cliveden house, 120 British soldiers barricade themselves inside to repel the American attackers. Wave after wave, the Continentals persistently pound the stone house with unrelenting musket and artillery fire. Despite the furious assault, they are unable to dislodge the stubborn British resistance. Second Pa. Regt. & 43rd Regt. of Foot. The violent and bloody Battle of Germantown impacts much of the surrounding town, making its houses the hosts of pivotal moments in history. With 969 soldiers wounded in the bloodshed, both sides urgently require shelter and care. Wyck, the home of pacifist Quakers, serves as a field hospital for many of the injured. Grumblethorpe was the headquarters of British General Agnew during the engagement. After being fatally shot by an American sniper, Agnew is dragged back to the home and dies in the front parlor. His blood still stains the floor. Deshler-Morris House, also called "Germantown White House," boasted George Washington's occupancy twice during his presidency in 1793 and 1794. 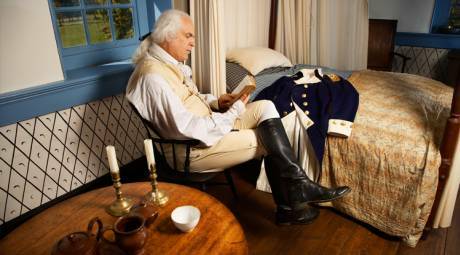 Washington fled Philadelphia to stay at the house during the Yellow Fever epidemic. It is the oldest presidential residence. 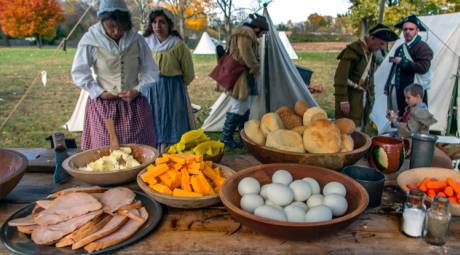 After the Battle of Germantown, American troops march to Whitemarsh on November 2 and encamp in the fields surrounding Hope Lodge. The lodge becomes the headquarters of Surgeon General John Cochran during the fall and winter of 1777-78. 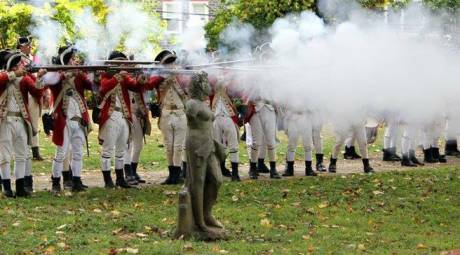 If Washington had succeeded at Germantown, the war could have abruptly ended due to the subsequent victory of the Continental Army at Saratoga, New York. The army's lack of discipline however, prevented the execution of Washington's plan. He now desperately needs a secure campsite to train during the winter months. Seeking one last opportunity to destroy Washington's army before winter, the British march 10,000 troops out of Philadelphia just after midnight on December 5, 1777 towards Whitemarsh. An American cavalry patrol engages the British and warns Washington. Washington orders his men to build additional campfires, making his army appear larger in the dark of night. The British halt, fooled by the ruse, and wait until daybreak, affording him precious time. Skirmishes ensue during the day. Still searching for a weak spot in the American line, British General Howe decides to flank the left side at Edge Hill on December 7, a tactic he had used at Brandywine that almost annihilated the Continental Army. Americans engage the British with "guerrilla" tactics in the dense woods of Edge Hill, but are driven back. Just as the position is about to be overrun by another wave of British troops, American cavalry and the 2nd Continental Regiment arrive, driving the British away. Washington's line holds. 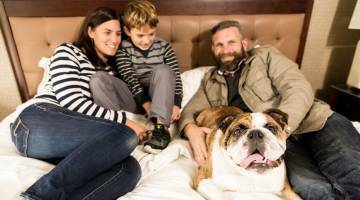 The weather is growing colder and Washington needs to find a winter encampment site. He decides on somewhere west of the Schuylkill River. The army begins crossing near present-day Conshohocken on December 11, however, American militia, sent in advance to cover the crossing, run into a British foraging expedition at Bryn Mawr, near Harriton House. The militia flees, discarding their weapons in panic. The American cross back over the river and destroy the bridge. They march west towards Swede&apos;s Ford, or as it is now known, Norristown. Washington, convinced that the area is vulnerable to attack, moves the army farther west. They now encamp at Gulph Mills. A severe snow storm batters the soldiers, many of whom are without a tent or blanket. Washington's personal assistant, Timothy Pickering, writes "The great difficulty is to fix a proper station for winter quarters. Nothing else prevents our going into them...it is a point not absolutely determined." Washington issues general orders. 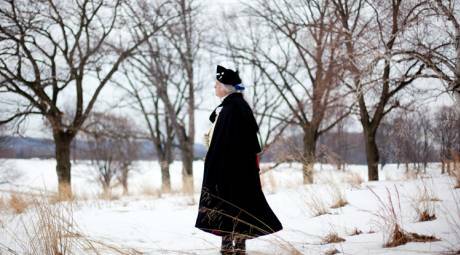 "The General ardently wishes it were now in his power, to conduct the troops into the best winter quarters," he writes. "Should we retire to the interior parts of the State, we should find them crowded with virtuous citizens, who, sacrificing their all, have left Philadelphia...To their distresses humanity forbids us to add. This is not all, it should leave a vast extent of fertile country to be despoiled and ravaged by the enemy, from which they would draw vast supplies, and where many of our firm friends would be exposed to all the miseries of the most insulting and wanton depredation... These cogent reasons have determined the General to take post in the neighbourhood of this camp"
On December 18, the soldiers are poised to move to winter quarters, but they do not march yet. Congress declares the first national day of thanksgiving in light of the pivotal American victory at Saratoga in October. The soldiers receive a small portion of beef. Some haven't eaten in days. They do not know yet that France formalized a military and trade agreement with the colonies yesterday. All that they know is that tomorrow, they march west and prepare to endure the bitter winter with little food, supplies or hope. 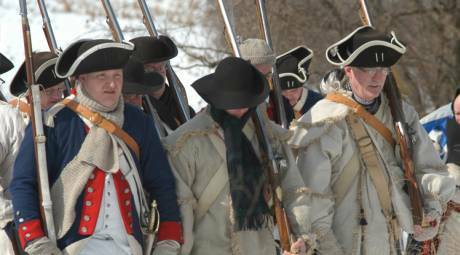 Reeling from crushing losses and a relentless bombardment by the British, Washington&apos;s army limps into the quiet village of Valley Forge on December 19. Many had no boots or shoes, and their feet were bound in rags to protect against the icy, frozen roads. Exhausted, the 12,000 troops begin building 1,000 log huts for the winter encampment. By February, death, disease, and desertions reduce the number at camp to 6,000. Washington knew if they were to win, the troops needed to be reinvigorated and properly trained. Former Prussian Officer Baron Friedrich Von Steuben tirelessly drills the soldiers, teaching them how to load their weapons faster and execute advanced battle formations. He works directly with the men, and his enthusiastic energy transforms them into an effective fighting force. 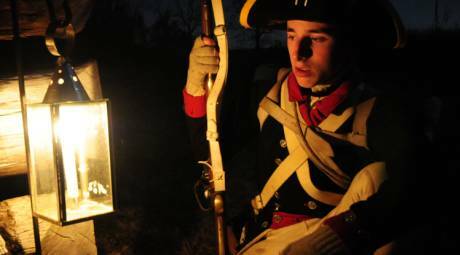 By June of 1778, the camp is alive with excitement and a renewed determination. Although no actual battle took place at Valley Forge, a decisive victory of will had been won. 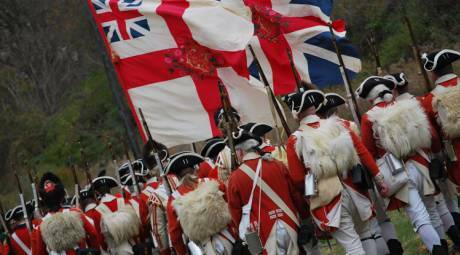 Washington&apos;s army was now prepared to face the British and give birth to a new nation.